The daisy is traditionally associated with childhood innocence, modesty, and gentleness, as well as with loyalty and everlasting love, making them especially suited to weddings. From Victorian days, young ladies often plucked daisy petals with the old “he loves me, he loves me not” repetition to determine if their love was true. Apart from their romantic connotations, historically daisies have been practical too.They have been used to treat a wide list of ailments, from eye problems, to stomach ulcers, gout, fever and wounds. 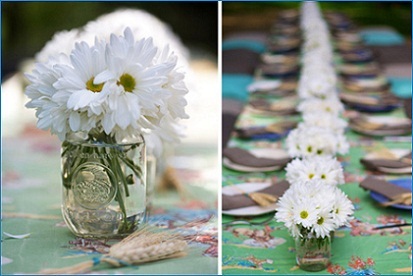 Today daisies remain a much loved choice because they are beautiful as well as hearty. They come in a wide range of colors, sizes, and varieties, making them a very versatile choice —there is a perfect daisy for any event! They are also budget-friendly, which is an added bonus. Some of the most popular daisy choices include the larger and more well known chrysanthemum daisies. These come in a variety of lovely colors, from pure white to rich purple, soft lavender and fresh pinks. They mix beautifully with other blooms such as roses, hydrangeas or lilies. Gerbera daisies were discovered in South Africa in the late nineteenth century. They are a gorgeous choice for almost any event that has a slightly more modern or informal aspect. They come in a variety of vivid colors, such as deep orange, hot pink and bright yellow. Button daisies are a wonderful accent flower. They add a pop of color and texture to bridal bouquets or centerpieces, are sturdy and compact. Daisies are perfect for outdoor events, such as summer picnics, rustic summer weddings, and can enhance even an elegant arrangement. They are perfect for boho chic events, or more relaxed “farmhouse” themes. 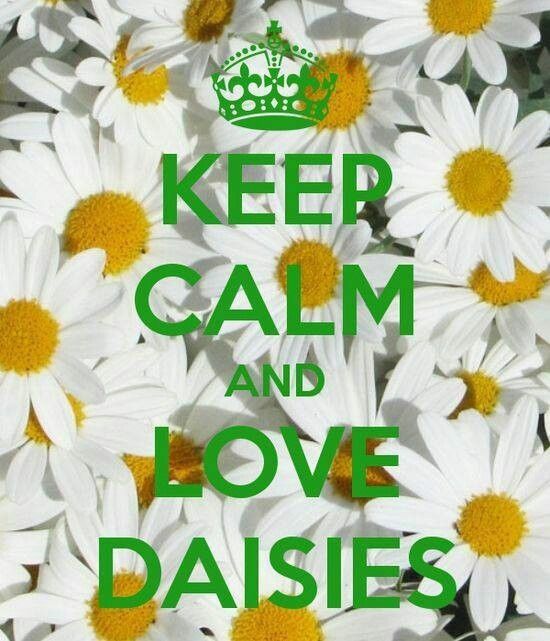 If you are crazy for daisies, you can’t go wrong! Whichever type or color of daisy you choose, your wedding or event will always be enhanced by these lovely blooms. You don’t have to break the budget to have beautiful flowers for your wedding or event! Some of the most popular and beautiful choices are also some of the most inexpensive. Read on to see our top picks for inexpensive, but totally gorgeous, flowers. These blooms could shine in any occasion, and can be used in bouquets as well as centerpieces. If you source them in season you can save even more, and especially if you use an online flower vendor (like BunchesDirect). 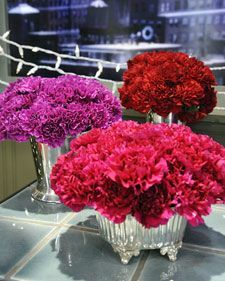 Carnations are so beautiful and yet are often undervalued for their ability to enhance a bouquet or table arrangement. We have no idea why! Their sweet ruffled petals add true elegance, while being long lasting and surprisingly hearty after cutting. They come in a myriad of wonderful colors that can coordinate with many themes and palettes.Their general hardiness also means they work well in DIY creations too, like pomander balls, garlands and floral accent walls. Alstreomeria, also known as Peruvian lilies, are one of the most delicate and lovely flower choices and yet are surprisingly affordable. Their sweet, heart-shaped petals add romance and delicacy to any bouquet or centerpiece. They come in several popular colors and have an interesting two-toned variation that adds depth and interest. Baby’s Breath, or Gypsophilia, is a wonderfully airy and beautiful flower that can create amazing cloud-like effects for table and venue decorating as well as for bridal bouquets. Most people think of it in white, but it does also come in soft pink. It can be combined with other romantic flowers such as roses or lilies, but don’t overlook its impact when used all on its own. Many of us simply call them “mums,” to refer to these beautiful and generous blooms. Chrysanthemums come in rich colors and have a full, exotic appearance that can lend a lot of impact and texture to bouquets and arrangements. They can be combined with other flowers for an “elegant” presentation or kept minimal and vivid for a more rustic or informal event. There is little else to match the lovely daisy for sweetness, innocence and cheerful beauty. Daisies have been a cherished flower for centuries and have long held romantic connotations. They are especially suited to informal events and outdoor venues, such as barn or beach, and to themes like boho chic or rustic. Use them in different colors to further enhance your decorating. Roses spell romance, elegance, and distinction. They are one of the most gorgeous flowers that work for any occasion, and if you purchase from a reputable online vendor (like BunchesDirect), roses are surprisingly affordable! Buy in bulk to save even more. Roses come in many shades and sizes and work with any wedding theme. They also pair beautifully with just about any other bloom. Dress them up or down depending on how formal is your event. You can never go wrong with roses! 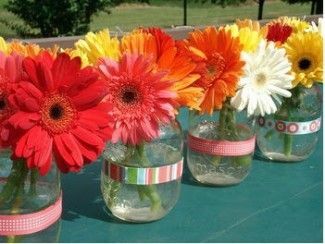 Cheery and bright gerbera daisies are great bang for buck! Their large size and textural quality create a lot of visual impact even if fewer blooms are used. They come in vivid and modern colors that are especially well suited to rustic weddings, boho chic themes, outdoor venues, or anything where a cheery and modern impact is needed. 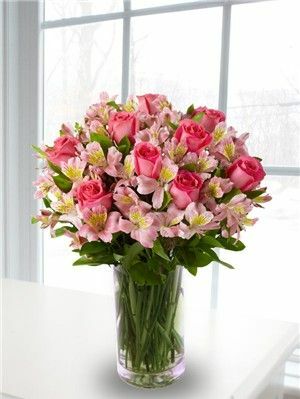 They also pair well with other flowers such as roses or carnations. If you are in the midst of wedding planning, or know someone who is, like many of us you may be turning to the pages of your favorite celebrity or fashion magazine for inspiration. Celebrities often have huge budgets for their wedding or special event, in addition to the services of some of the top wedding planners and florists in the world. They spend a lot of time selecting the perfect bouquets to complete their ideal bridal look. To help you in your own quest for the perfect bouquet, we’ve taken some of the most beautiful celebrity brides, and provided our “copycat” choices. These bridal bouquets are ready to order, farm fresh and very affordably priced! The best part? They could save you hundreds and hundreds of dollars! Check beneath each summary to see our bouquet picks. 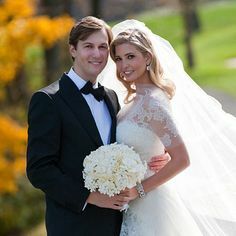 Ivanka’s uber-elegant 2009 wedding to Jared Kushner at Trump National Golf Club. The posh affair featured all white flowers by renowned event planner Preston Bailey. Her bouquet was a divine combination of delicate stephanotis and beautiful white roses. Read more about Preston Bailey wedding ideas and see our ‘copycat” pick below. Kelly’s bouquet was the perfect complement to her gorgeous 2013 rustic wedding at Blackberry Farm in Tennessee. Sunflowers were the star of her country bouquet, complemented by heather, dusty miller and agapanthus. She has since given birth to two children and she and Brandon remain happily married. This feisty Colombian-American actress, best known for her hilarious role in Modern Family, proved to be a luxurious bride with a massive wedding budget. She married actor Joe Manganiello in an elegant and extravagant 2015 ceremony in Palm Beach, Florida. Her wedding flowers, designed by renowned floral artist Jeff Leatham were absolutely stunning! To see more of them, read the Sofia Vergara blog. Her bouquet was made of dazzling all white Phalaenopsis orchids. Think orchids are too expensive for you? Check out copycat bouquet choice below and see even more the BunchesDirect site! Shenae is best known for her work on Beverly Hills 90210. She married in 2013 at Boys Hall, in Ashford, Kent, looking dramatic and glam in a daring (and very beautiful) Vera Wang black gown. 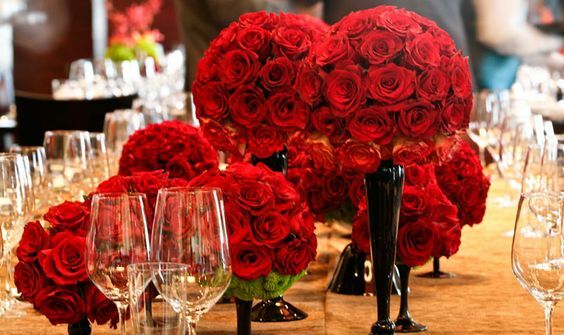 Shenae boosted the drama quotient even more by choosing elegant red roses for the main element in her bouquet. 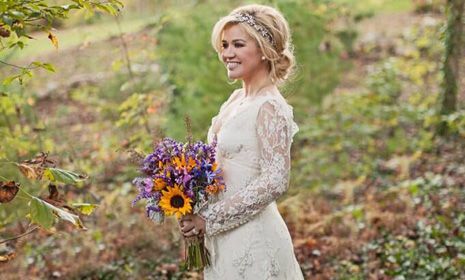 American Idol provided us with another sweet celebrity bride, in the form of Carrie Underwood. Carrie married hockey star Mike Fisher in July 2010 (we can’t believe it was that long ago!) at the swanky Ritz-Carleton Reynolds Plantation in Georgia. Her wedding featured roses, roses and more roses: a rumored 3,000 of them, to be exact! Her dreamy bouquet included other blooms such as white, yellow and pale pink peonies, hydrangeas and dahlias. 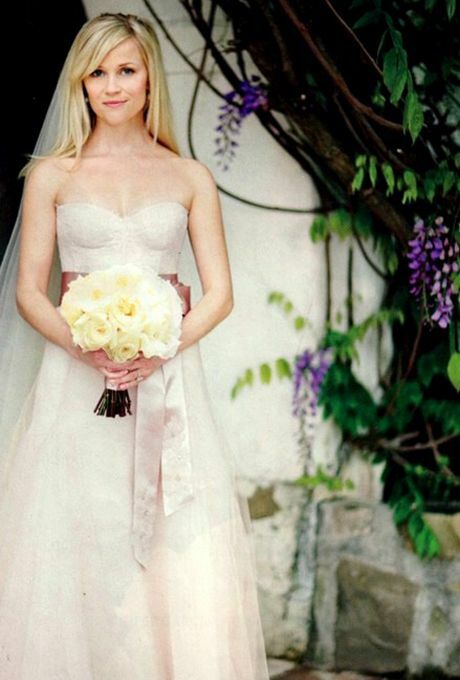 Reese is a happy woman these days, following her marriage to Jim Toth at Libbey Ranch in Ojai, Califonia in 2011. The couple have since welcomed a son together in 2012. Reese shone on her wedding day in a custom Monique Lhuillier blush gown, perfectly complemented by this elegant bouquet of Patience roses. Find out how to make a Reese Witherspoon bouquet and see our pre-made pick below.